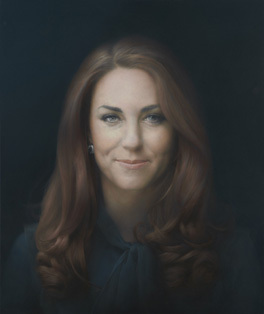 Kate has her first official painting on display in the National Portrait Gallery. It is a frightfully modern take on royalty. The painting shows the unofficial side of Kate, with hair down and no red/fur/tiaras to be seen. Quite remarkably the painting has also managed to age her ten years – Dorian Grey anyone? After seeing the image online, I thought this was one of those paintings that would be better in person. Nope. Somehow in real life the image is even more misty and hard to view. Or as the octogenarian next to me put it “it looks like she’s dead”. Given that one of the winners of the NP award a few years back was an artist who painted her own mother on deathbed, dead, we can assume it is a trend.